Episode Forty-You too could be a Legendary Listener. The new trailer for “The Martian“. We are very excited for this movie. Our discussion covers Ridley Scott, his long, uneven, but legendary career, the magnificent cast for this film and stellar novel the movie is based upon. Take if for yourself and let us know your score! Christopher continues with “Dark Matter”. The first season is coming to a close and it’s been solid entertainment. He took his youngest daughter, Keira, to seen “Ant Man“, she loved it. Movie is surprisingly effective in emotionally connecting the viewer to the ants. Andrew saw “Hitman: Agent 47“ and not it’s as bad as he thought it would be. Most of it doesn’t make a lot of sense though. Patrick watched “Sinister Part 1“. Scary, like poop scared out of you scary. Patrick watched “What We Do In the Shadows”. New Zealand brand of humor. Andrew finishes “Leviathan Wakes” Spoilers abound! Come back in Five minutes! Patrick purchased “Caliban’s War” on Audible, the Second book of The Expanse series, he hadn’t listened to any of it yet, but was enjoying “Ready Player One” again. Christopher is deep in “The Player of Games”. As a gamer himself, he wishes the book was a little more detailed on how the games the main character is a master of actually work. Andrew and Christopher play “Destiny“ and they purchase the most coveted weapon in the game, the Gjallarhorn, so fun but insanely over powered. The weapon doesn’t take a lot of skill to be good with it. Christopher works to unlock flying in the land of Draenor in “World of Warcraft”. And of course, “Rocket League”! Patrick plays “Castle Panic“. He feels like he has mastered the mechanics of the game after just a couple sessions, fun, but not top tier as far as table top games go. This entry was posted in Podcasts and tagged Castle Panic, leviathon Awakes, Rocket League, The Martian, World of Warcraft on August 25, 2015 by BrothersGeekadmin. Thirty Nine: We turn our Star Wars up to 11. Episode Thirty Nine: We turn our Star Wars up to 11. New photos of “Star Wars: The Force Awakens” released in Entertainment Weekly prompt an enthusiastic discussion. It may not be possible for us to be more excited for this movie. Christopher is enjoying “Dark Matter”. Solid Sci-Fi on the SyFy Channel. “True Detective” Season 2 wraps up and is quite disappointing. Season 1 is far more effective. All have seen “Mission Impossible: Rogue Nation”. All find it well made action movie fun.. Andrew and Christopher are particularly impressed with Rebecca Ferguson‘s Ilsa Faust. She every bit an equal to Tom Cruise’s Ethan Hunt. Patrick saw “Terminator Genisys”. It is so so so bad. Patrick doesn’t want any more Terminator movies with this cast. Patrick has listened to Book 2 of “the Dresden Files” He blasted through it in 3 days! Jim Butcher writes very well. All agree to pick up his new “Steam Punk” series starting up in a few weeks. Andrew is deep in “Leviathan Wakes”. He just reached a massively important part of the novel and he felt something pop in his brain. Chris plays “Rocket League” The new DLC appears to only add to the fun. He is playing multiple matches in multiple game modes. Andrew reports on the changes coming to “Destiny” with the DLC “The Taken King”. The leveling system is dramatically changing and we all start yelling at each other. Mostly Andrew yells at Patrick. It’s a good honest, heated discussion. It’s what we are all about. How many horns are on Darth Maul’s head? It’s a truly obscure question and the Boys react accordingly. 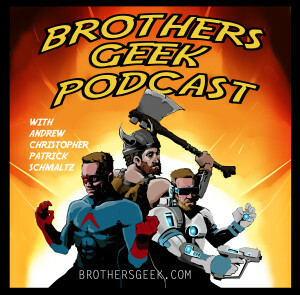 This entry was posted in Podcasts and tagged Destiny, Rocket League, Star Wars The Force Awakens, The Dresden FIles on August 16, 2015 by BrothersGeekadmin.